Stay up to date with the latest in family, food and fun! My All Time Fav Kids Cookbooks ! My Favorite Kids Books About Food! 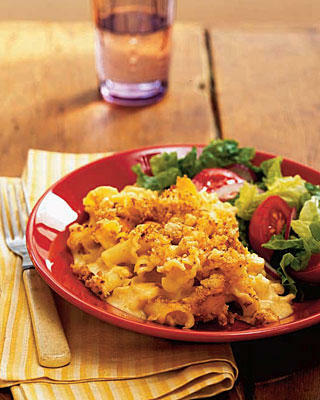 Chances are your little one has something in common with President Thomas Jefferson – a love of cheesy macaroni! While not the healthiest of foods, macaroni and cheese is a great, warm treat on a rainy day. Everyone needs a little comfort now and again, right? This is my favorite indulgent meal. Remember, it’s a treat! This treat has been popular over history as well. Known by many names –mac and cheese, macaroni cheese in British English, or macaroni pie in Caribbean English – the casserole simply has elbow pasta and a cheese sauce. Often people get creative with the dish adding vegetables or pieces of bacon. While considered a Southern comfort food by many here, mac and cheese has a rather regal background. Macaroni is mentioned in various medieval Italian sources although it’s not clear if it’s a pasta shape or prepared dish. A 14th century English cook book makes mention of a cheese and pasta casserole called Makerouns. It was simple: Fresh hand-cut pasta is sandwiched between a mixture of melted butter and cheese. The dish was an upper-class dish until the 18th century. Thomas Jefferson was fond of macaroni and kept a pasta maker. He was also served macaroni pie while serving in the White House. It doesn’t have to be that complicated though. Here’s a basic baked macaroni dish. Feel free to get creative with your own additions! 1. In a saucepan, melt the butter over medium heat. Add the flour and cook, stirring, for 3 minutes. Slowly whisk the milk into roux. Add the salt, Parmesan cheese, nutmeg and cayenne. Bring to a simmer, stirring often and cook for 5 minutes. Remove from heat and reserve. 2. Cook macaroni in salted water, according to the package directions, and drain well. Transfer to a large mixing bowl. Pour in the sauce, add most of the cheese (save about 2/3 cup for the topping), and fold with a spatula to combine. Transfer into a lightly buttered 13 x 9 casserole dish. 3. Top with the remaining cheese. Mix the breadcrumbs and the butter, and spread evenly over the top of the macaroni and cheese. Bake at 400 degrees F for 20-25 minutes, or until the top is browned and crusty. It’s time to get seasonal, seasonal!